The flyby of Pluto is now an accomplished fact. It marks the end of a process of putting a real face on the planets of our solar system. This process began in the first planetary expeditions back in the 1960s and has resulted in dazzling new images of what have historically been only lights in the sky. Speculation has given way to observation. And every new observation has led to dramatic new insights into the processes by which the solar system has developed. Every planet in the solar system has revealed things no one expected. How do you put a price on that new understanding? Can this not be inspirational? Does the technology of space exploration not represent the best of what we humans can do to gain new insights into our place in the universe? It seems to me that the naysayers regarding space exploration have devalued the impact of inspiration on the human species. We can be inspired by what amounts to mythology - the mythology of religion for instance - that often results in visiting violence upon other humans who happen to believe in different myths. We can be inspired by the notion of our nation as an exceptional example of the freedom of the human spirit - and our preeminence on the world scene - resulting in a national arrogance that leads to violence against other nations. But the inspiration that comes from exploration of the cosmos leads us to the realization of our insignificance on the scale of the universe. Rather than arrogance, this is an inspiration that leads to humility in the face of the cosmic questions. We see writ large in the universe that we humans are little more than dust motes in the vastness of the universe. Is this a negative thing? I think not. It reminds us of our place as bit players in a cosmic stage but it also says man is not apart from the universe, but rather is a part of it. Yes, our part is small and mostly insignificant. But we are part of something enormous! Personally, I don't find this to be belittling of our place in the universe. In the cosmic picture, we are necessarily trivial and our fate is of no significance to the cosmos. Nevertheless, we are here because of cosmic processes that foster life. In a very real way, we have learned that we are children of the universe and its processes. We are here because of cosmic processes - the universe come to life and contemplating itself by means of our consciousness. It's likely that life exists on many planets throughout the universe and that life is also a part of the universe. We may eventually learn of that life through the efforts of those inspired to support exploration of the universe. It will be a great day in our history when we learn of life not of this Earth! Is not the exploration of our universe among the most inspirational of our human efforts? How can anyone believe that our human problems are a reason to not pursue this topic? An inadequate grasp of our place in the universe would lead to trivialization of the wonders being revealed to us by virtue of the space explorers! It's been my privilege to see the wonders of our solar system revealed by the efforts of those inspired to participate in this great adventure. I'm happy to have lived during a time when these majestic images have made the solar system much, much more than mere points of light! My thanks to all of those who have made this happen! Recent events reveal that a prediction I made long ago apparently has been verified. I'm not happy about that, however. Sadly, a storm chaser has been charged with running a stop sign and killing two people in the resulting collision. Time will be needed to learn the details, and to determine whether or not he is guilty as charged. If this storm chaser was actually chasing at the time, and the fatalities are proven in court to be his responsibility, this will be a very sad time in the history of storm chasing. It's another predictable but terrible "milestone" in storm chase history, just as 31 May 2013 will live in infamy because of the unfortunate deaths of three storm chasers who were hit by the El Reno, OK tornado. Although Tim Samaras and the Twistex team were quite responsible storm chasers, their objectives required them to take extreme risks. Note: at this point, I have no idea if this chaser is routinely irresponsible in his chasing, but it only takes one incident of irresponsibility to ruin everything. 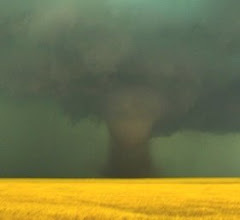 Hence, although some of this blog may not apply to him, it's the incident that has caused me to reflect on extreme chasers, who engage freely in life-threatening acts. Extreme (or "outlaw") storm chasing has become relatively widespread, likely in part because of what people routinely see in entertainment media. It's not reflective of the majority of chasers, but extreme chasers apparently like to think of themselves as "above" most other chasers. The whole notion of being an "extreme" chaser is considered in those circles as a badge of honor, worn with pride by those willing to do virtually anything to catch a sensational event, right up to the edges of death. Those of us advocating a responsible approach to chasing have been ignored openly. Further, we've even been bashed in social media by some of the extreme chasers, who enjoy flaunting their disrespect for advocates of responsible chasing. I certainly have been singled out by some as a target for their antipathy. It's precisely that sort of macho bravado that concerns me: I predicted that fatalities inevitably would result from extreme chasing and, in this case, being right is cold comfort. This case is even worse than having chasers die in a tornado chase. Having one's actions result in the death of two innocent people simply going about their business is worse, as I see it, than a chaser dying as a result of doing dangerous things around a storm. I've said all along the greatest threat to chasers is being on the streets and highways, and that threat includes any non-chasers who happen to be in the path of a chaser doing extreme things. Years ago, my wife and I were chasing - I think it was in Nebraska but I can't recall - and we came upon the scene of a collision in a small town (with brick streets). A chaser had T-boned some locals, although apparently without serious injuries. The chaser's vehicle wasn't one we recognized; it had some decals that indicated it was a chaser, however, and had CO license plates. Although we didn't see the collision, it seemed evident that the local driver had underestimated the speed of the approaching chaser (who likely was exceeding the in-town speed limit) and tried to cross the intersection before the chaser came through. I never heard anything afterward about this wreck, so evidently the media never picked up on it. With today's social media, we'd probably have heard more about what happened and who was responsible. This was a very sobering consideration - many extreme chasers are quite ready to admit they often exceed speed limits in their efforts to get a storm*. I've seen their own videos showing them speeding, driving on the wrong side of the road, running stop signs, etc.! I'm unaware of any fatal collision initiated by a chaser before the current example. However, if any such wreck has happened in the past, we just may not know about it. Although not as well-known, it seems some inexperienced chasers were killed by the Tuscaloosa, AL tornado two years before the sad death of Tim Samaras and his team. The AL fatalities didn't receive a great deal of media attention, so there could be earlier incidents of chaser-responsible traffic fatalities about which we haven't heard. If extreme chasers continue to be irresponsible, my forecast is that there surely will be more examples! The "outlaw" chaser, perhaps seeking to borrow from the romanticized image of the fictional anti-heroes so popular in the entertainment industry, is not a flattering image for storm chasers. I certainly have become quite tired of having to answer for the irresponsible deeds of "extreme" chasers. These are not just playful antics or about the courage of the chaser - they represent a real hazard to the extreme chasers and those who happen to be near them in the heat of a chase. *I won't claim I never exceed the speed limits, but I certainly would not want to speed through a small town - not just to avoid getting a speeding ticket, but because it isn't a very responsible thing to do. If I occasionally speed in open country, it's not something I would choose to boast about with the media. It's behavior I prefer not to advertise as something of which to be proud! Is religious indoctrination of children abusive? This blog is the result of seeing the headline question posted on an atheist FaceBook forum. The statement is made by some atheists to the effect that when parents indoctrinate their children with religion, it's a type of child abuse. I wanted to offer my thoughts on the topic here. For the most part, in the USA, we're talking about christianity, although some of this might apply to other Abrahamic religions. I'm not so knowledgeable about them. I also acknowledge that your experiences and understanding may vary from mine. That is, there are around 40, 000 different versions of christianity, and they distinguish themselves in various ways based on their particular doctrines. My comments are keyed to the version of christianity that I was taught in an evangelical lutheran church because that's what I know best. Of course, my understanding of that is biased since I never really bought into the program, and left it as soon as I felt I could. Hence, I admit my comprehension could be flawed in detail, but probably not in basic doctrine. So, disclaimers done, let's proceed: in the version of christianity I was taught, there's an all-powerful, all-knowing god who rules the universe he created from nothing. This god is acknowledged to be a jealous god (a curiously human sentiment for an all-powerful being), so he has no tolerance for belief in other gods. He demands humans worship him, and only him (sounds like deep insecurity to me). Somewhere in the universe, this god created two places where people would go after they lived out their days on the Earth: joyful heaven for the believers and horrifying hell for the heathen unbelievers. Evidently, this god also created an evil opponent (for no obvious reason), the devil (satan, or whatever) to seduce people away from the path leading to heaven, in order for them to land in hell where he tortures them forever. This is pretty much the prototypical "carrot and stick" for humans. If you swallow the story, you get the carrot; if you don't, you get the stick - hard and forever! Because a woman was convinced to eat some fruit by the devil (in the form of a talking snake), all of humanity is scarred by her free choice to disobey god (See the messages, here?) for all time. Now that's god's justice and love, right? I think it's pretty safe to say that the vast majority of christians in the US were born into and raised within christian families. It's virtually certain that this, and this alone, is the primary explanation for the predominance of christianity in the US. Religions are perpetuated in this way - Richard Dawkins has referred to religions as "God Memes", where a meme is defined as "an idea, behavior, or style that spreads from person to person within a culture". The meme is, therefore, self-replicating. Not everyone exposed to a meme is brought under its influence, of course, so not unlike the way DNA operates, the replication is not always completely perfect. I'm an example of someone who didn't accept the this "god meme" - what I was taught never made any sense to me. But for many (most) believers, being raised in a family with a particular religious bent is sufficient to indoctrinate them with the meme and by this means, the meme is perpetuated. From my viewpoint, I have no problem with someone accepting the tenets of christianity, although it's always puzzling to me when otherwise intelligent, rational people choose to accept what I see as a preposterous story with virtually no supporting evidence. There are many positive aspects of christianity (although they vary from one to another of the 40, 000 flavors), so inculcating the traits of kindness to others and love for all god's creations, for example, can't be a bad thing. Many christians find the notion of love for all god's creations (e.g., homosexuals or socialists) pretty challenging! The message may (or may not) be inherently abusive, but what I find to be obvious child abuse is the creation of fear and self-loathing. In the version of christianity I was taught, all humans are scarred indelibly with the sin committed by the first two humans who were tricked into going against god's rules. Presumably, a (temporary) human sacrifice (by the "son" of god, via a "virgin birth") is the only way to redemption chosen by god for the original sin, provided one accepts the temporarily murdered son of god as their lord and savior. Frankly, I find this notion totally absurd, but everyone is free to believe whatever they choose. Just don't ask me to buy it! The content of religion isn't necessarily abusive on its own. But the use of fear, guilt, and shame to force children down your parental "path of righteousness" is child abuse. If you're a christian, you almost certainly want your children to accept your version of the one "true" religious faith. Using abusive tactics to accomplish that goal clearly is an immoral thing to do, at least in my book. If you're an atheist, the proper thing to do is to encourage your children to make up their own minds about religion. This necessarily involves letting them learn about religion, and to give them the self-confidence to resist the peer pressure they'll surely get from their indoctrinated peers in order to make an informed choice as they mature into adults. Most atheists don't seek to force atheism on believers - they want believers to (a) support separation of church and state, and (b) accept atheists without hate and contempt, thereby living up to the positive ideals of christianity.